What is it about building robots that is so much fun? If you ask a kid, you will likely get a meaningful answer… however when it comes to grown men the wide-eyed fascination of youth has developed into a serious pursuit of quirky techno-novelty. In recent years, drones have joined the venerable robot as one of the top projects for big boys to tinker away at. Through laser cutting, the design process for both drones and robots is streamlined and fully functional prototypes are just a mouse click away. Laser cut robots take on many forms, often with a principle function driving the design of structural elements. A good example is the four-legged robot walker pictured above, from user hardmouse on Let’s Make Robots. Laser cut MDF body and leg segments support the servos and electronics which enable the robot to move at an impressive pace across smooth surfaces. When speed is the priority, wheels are the way to go. The distinctive neon green acrylic glows along laser cut edges of the MURCS wheeled robot (below, left) by Robot Freak. This little robot moves about in much the same way as a robot vacuum, and is primed and ready to taunt cats (amongst other important tasks). A robot of a different sort, Brian Roe’s Roy the Robot was lovingly constructed with education in mind. Here we see one raised hand (below, right), highlighting the detail and precision that enabled Roy to win over so many hearts on Kickstarter and beyond. Inspired by the stately and graceful Strandbeests from Theo Jansen, the laser cut acrylic walker from 4volt (above, bottom-left) has an organic locomotion that is beautiful to watch. 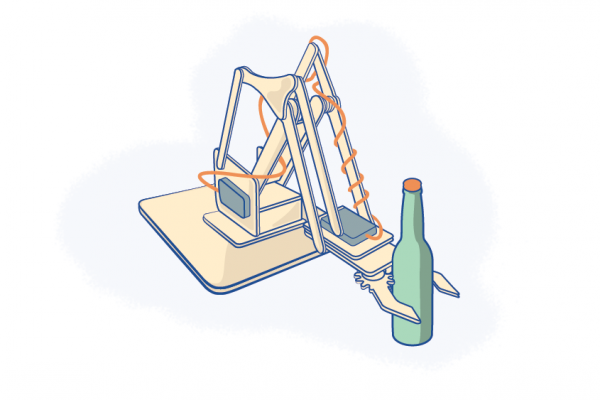 Returning to a more traditional robotic mechanism, the grasper claw and robotic arm (above, bottom-right) from letsmake.org is one of those ‘learning tools’ that would be a lot of fun to subvert and get up to mischief with. As well as being the focus of much amusement, robots can also provide practical help. The Etch-a-Sketch Bot is perfect for times when your thumbs are worn out from an etch-a-sketch marathon (above, left) and the unusual cardboard ninja robot by romanjurt on Thingiverse (above, right) dispenses smarties while rolling its eyes at you. Laser cut projects sometimes take on a robot persona without the need for any mechanism or mechanical parts. 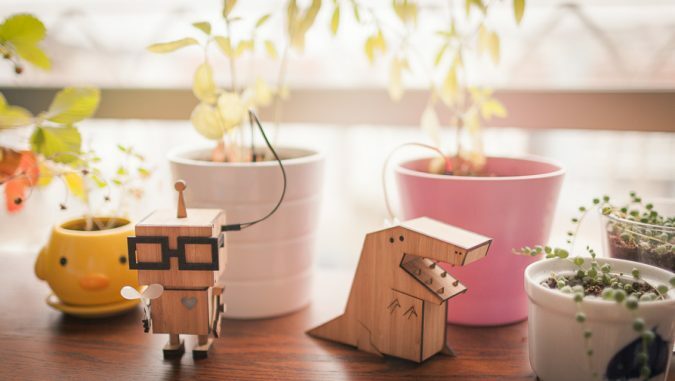 For example, the laser cut bamboo critters from Dickson Chow (below) are actually sophisticated moisture monitoring devices that will alert you when your house plants start to run dry. Sometimes it is enough to be robot-shaped and cute. No moving parts, no cogs or gears or electronic components. 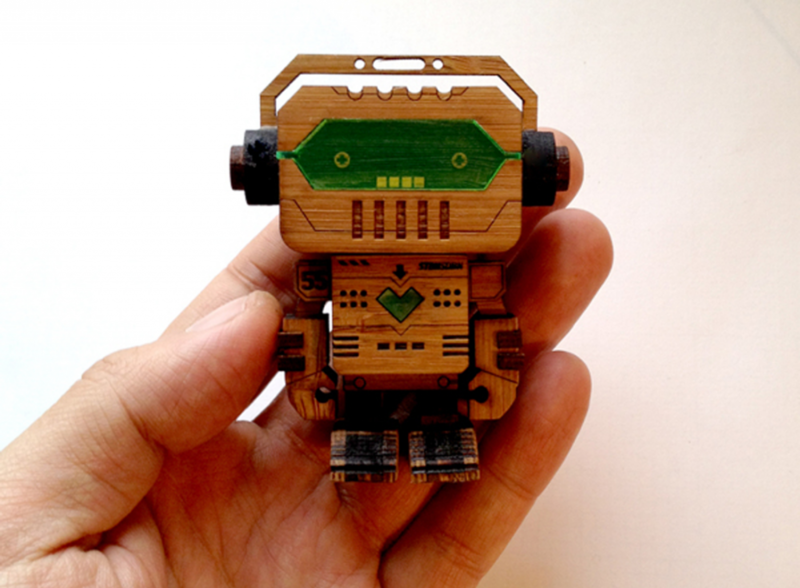 The delightful Chibipocket series (above) are full of character and help to remind the big boys of where this fascination with robots all began. 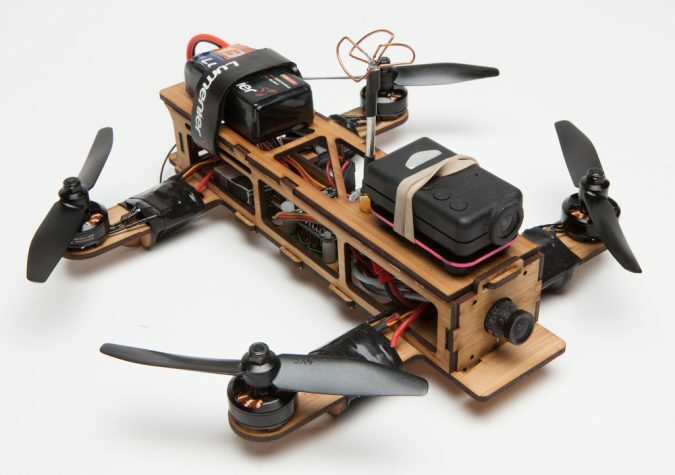 Drone enthusiasts are getting pretty excited about the latest commercial products, but that doesn’t hold these guys back from having a go with their own DIY laser cut drones. 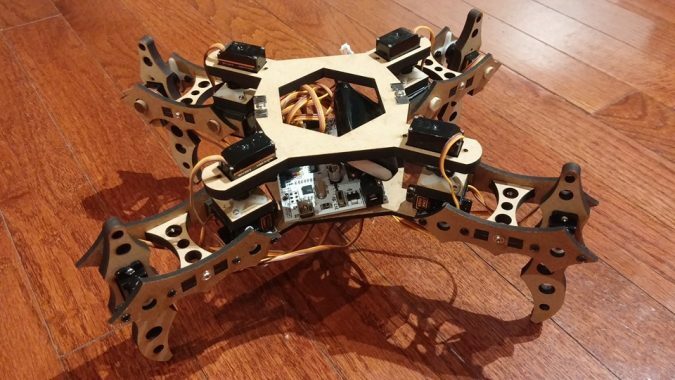 The octocopter pictured above from Jared Reabow on Instructables is a part of a range that includes cleverly resolved gimbals robust enough to support a full sized DSLR camera. Laser cut acrylic is ideal for drone components. Pictured above are two ‘mini racing’ drone chassis. The red acrylic of the partially assembled unit from DIY Drones (above, left) and the smooth contours of the clear acrylic version (above, right) from Whiplash42 present a refined visual that laser cut wood can only dream of. Continuing on this theme, the acrylic drone with built in blade guards from Banana_Science on Thingiverse (below, left) is frugal indeed with a parts and material cost of just $100. Another interesting direction for laser cut drones is to further accessorise and enhance commercial drone products. The transparent acrylic crash guard (below, right) from Phantom Pilots attaches to a DJI drone and shields expensive camera equipment from being a point of impact if the drone crashes. For the first-timer, it is a good idea to follow through step-by-step with an existing project that has proven success. 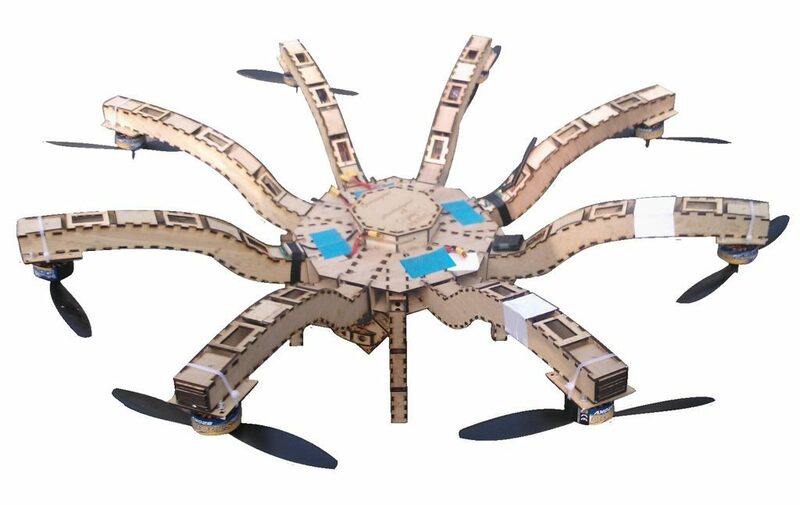 When it comes to drones, the Shendrone by Andy Shen (below) is cost effective with structural material laser cut from bamboo ply, and a snap-fit assembly means no glues or screws to slow down the construction process. Whether you’re building a two, four or ten-legged walker or a zippy DIY drone, laser cutting enables highly resolved outcomes quickly and at low cost. As we’ve seen in this small collection of examples, there is a broad scope for what can be considered a ‘robot’, and while drones require a tighter focus so that they can actually get off the ground, there is still a healthy variability in design options and materials. 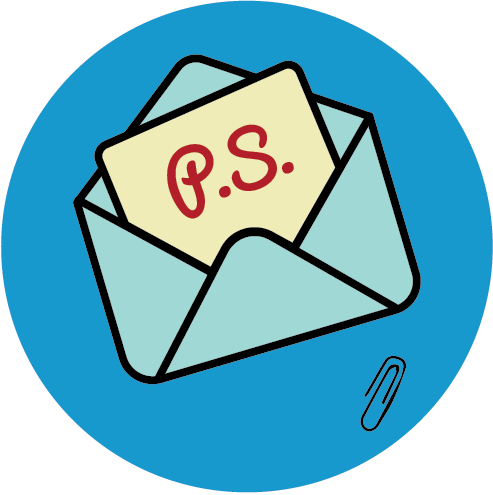 Do you have ideas for a clever robot or drone that can be laser cut in the Ponoko Personal Factory? Let us know in the comments below!